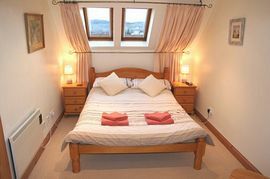 Staball'Ard is an ideally situated holiday cottage accommodating 2 to 4 people. It is set within a secluded courtyard only 100 yards from the centre of Aberfoyle, with its pubs, shops, restaurants and other amenities. Aberfoyle is a delightful village by the River Forth, in one of Europe's most beautiful locations at the southern edge of the West Highland Fault, lying inside the Loch Lomond and Trossachs National Park. Aberfoyle is known as the southern gateway to the Trossachs and is an ideal Scottish holiday location, whether you like fishing, hill walking, cycling or golf, or simply relaxing in beautiful surroundings. The cottage is warm and comfortable, with full electric storage heating and is equipped with all the facilities you may need. 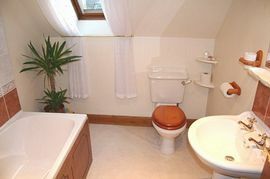 There is a large bedroom with a double bed and plenty of storage space, adjacent to a modern bathroom with shower, bath, WC and hand basin. 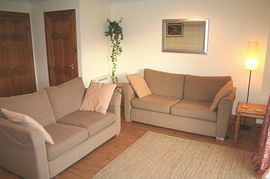 Downstairs there is a spacious open-plan living/dining/kitchen area, including a comfortable sofa-bed. 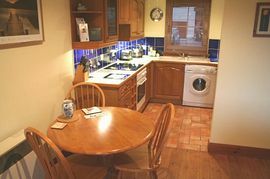 The kitchen is fully equipped with appliances and a comprehensive range of crockery, cookware and utensils. From the living room there are patio doors leading to a south facing sun terrace with garden furniture and barbecue. There is private parking in front of the cottage. Bed linen and towels are provided and electricity is included in the price. Bookings can be made easily and simply online and a deposit can be paid by cheque, credit card, bank transfer or PayPal. Leave the M9 at junction 10. Take the A84 signposted to Aberfoyle. After 4 miles turn left onto the A873. After 7 miles the road to becomes the A81. After a further 5 miles, turn right onto the A821 at the roundabout. Continue for 1 mile into Aberfoyle. 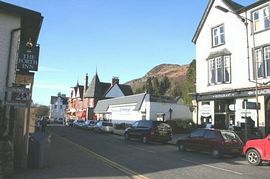 At the end of the high street, turn sharp right, still the A821, signposted to Callander. The entrance to Staball'Ard is about 20 yards on the left. Low Season: £250.00 per week. Mid Season: £320.00 per week. High Season: £380.00 per week.